Contraflow lanes enable connectivity and shorten travel times for bus routes. Contraflow lanes are typically applied to transit routes to create strategic, efficient connections, but may also be applied to longer corridors in some types of street networks. The contraflow lane can be thought of as a conventional two-way street, but with non-transit vehicles prohibited in the contraflow direction. Used on streets where general traffic is limited to one-way, but transit operations benefit from bi-directional transit routing. 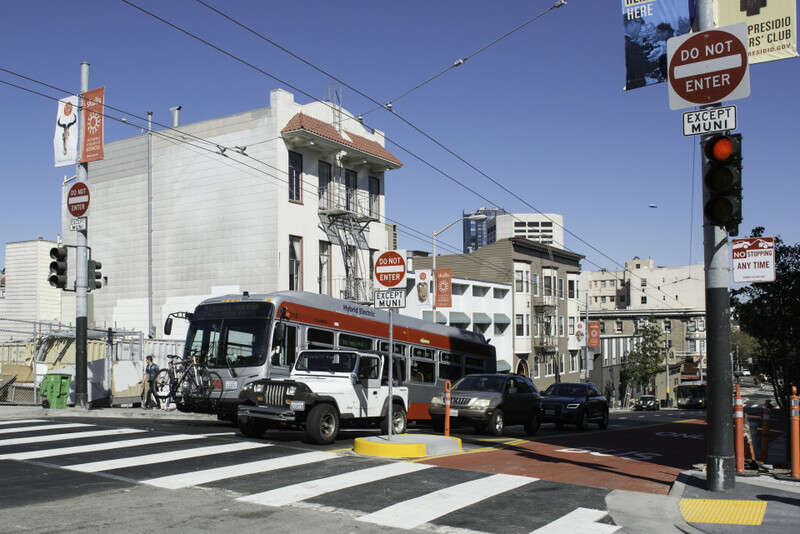 Contraflow operation allows more efficient transit service where a one-way street network would otherwise involve route deviations or additional turns. 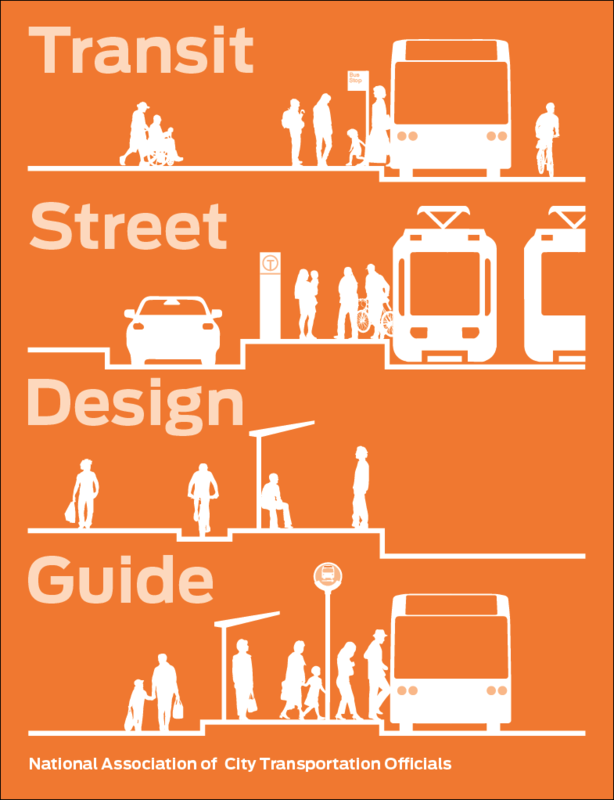 Running both directions of transit traffic on a street, instead of using a couplet of nearby parallel one-way streets, improves route legibility for passengers and better serves key destinations. A double-yellow centerline marking (MUTCD §3D-02) must be applied to separate contraflow traffic from opposing traffic. BUS ONLY or LRT ONLY markings must be applied to demarcate the lane and deter drivers from using it (MUTCD §3D-01). Arrow pavement markings (MUTCD §3B-24) should be used to indicate direction of travel. Gateway treatments that clearly prohibit wrong-way or private vehicle entry are essential to safe and functional operation. Use DO NOT ENTER and BUS ONLY (MUTCD §3D-01) or LRT ONLY signs for contraflow lanes; use ONE WAY EXCEPT BUSES signs (MUTCD §2G-03) for general traffic lanes. 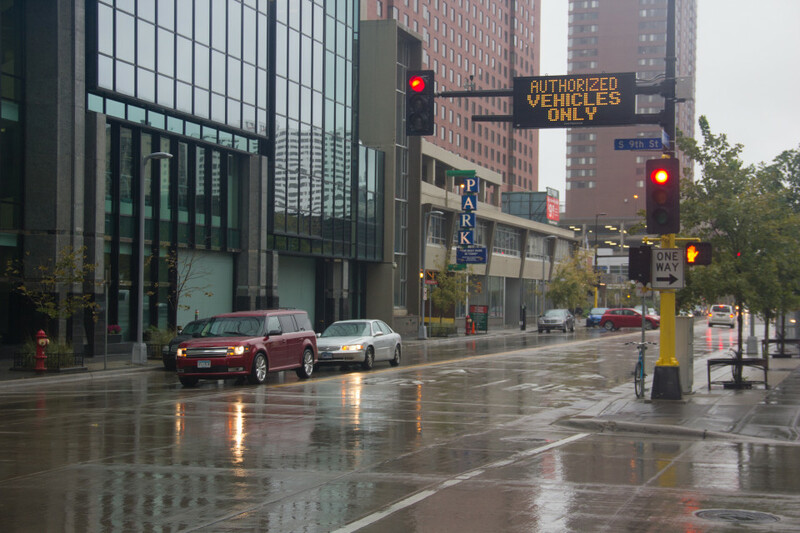 At signalized intersections, install transit-only signals and bicycle signals facing the contraflow direction. Calculate clearance intervals using bike- and transit-specific speeds to provide safe movement across intersections. 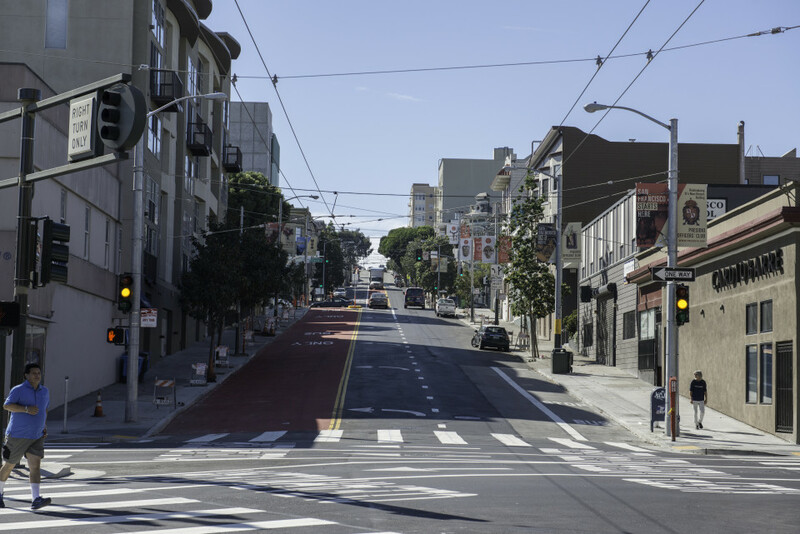 Contraflow lanes should be 11–12 feet wide. A buffer should be applied when additional space is available. Red color should be applied to emphasize the lane and to deter drivers from using it. Traffic signal coordination should be updated to reflect the two-way flow of buses. Intersection turn management improves the safety and operation of a contraflow lane, and enables the addition of bikeways adjacent to the lane. 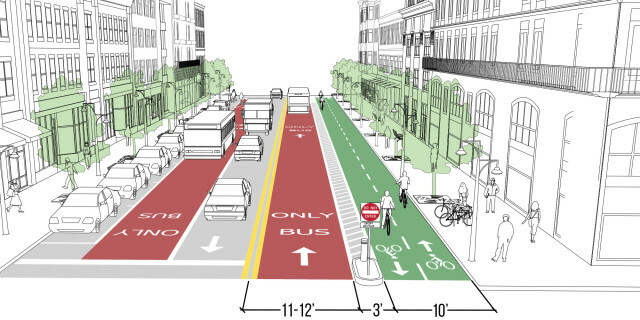 Where space is inadequate for a dedicated bike facility (either cycle track or contraflow bike lane), bicycle traffic may be allowed to use the contraflow bus lane, as long as the lane is wide enough to allow safe passing at stops (refer to Shared Bus-Bike Lanes, page 122). Where bicycle traffic is permitted, ONE WAY, DO NOT ENTER, and turn prohibition signs should be supplemented with an “EXCEPT BUSES AND BICYCLES” plaque. Hard separation, such as curbs or bollards, or soft traversable separation, such as rumble strips, may be applied in the buffer or centerline to deter vehicles from encroaching. Access to the curb must be maintained for emergency vehicles. If bicycle travel is anticipated on the contraflow lane, it is critical that any soft separation is safely traversable by bicycles. A contraflow configuration that includes a bikeway, pedestrian refuge islands, and/or left-turn lanes creates conditions suitable for longer contraflow routes. Multiple contraflow lanes may be implemented on a street, accommodating very high transit volumes.